Oatmeal is not very photogenic! So that whole long intro was really a plug for you to give the Apple Oatmeal Pudding recipe a try. If you like oatmeal in the mornings, this is a nice way to bake yourself enough for four days in advance, then all you have to do is microwave it for a few minutes and add some milk to get it to the desired consistency and you’re golden. It’s actually a bit thicker of a consistency because the baking allows the oatmeal to set, but not in that gross “it’s now a huge brick” sort of way, more like a casserole that’s held together with the oatmeal. I love the recipe, which is a hand-me-down from someone in my mom’s office about ten years ago, because it really gives you a warm feeling inside. Let me know what you think! Just don’t be deterred by the photo which, as I hinted above, is not entirely inspiring. We can and do feast with multiple senses, but it doesn’t always have to be with the eyes first. 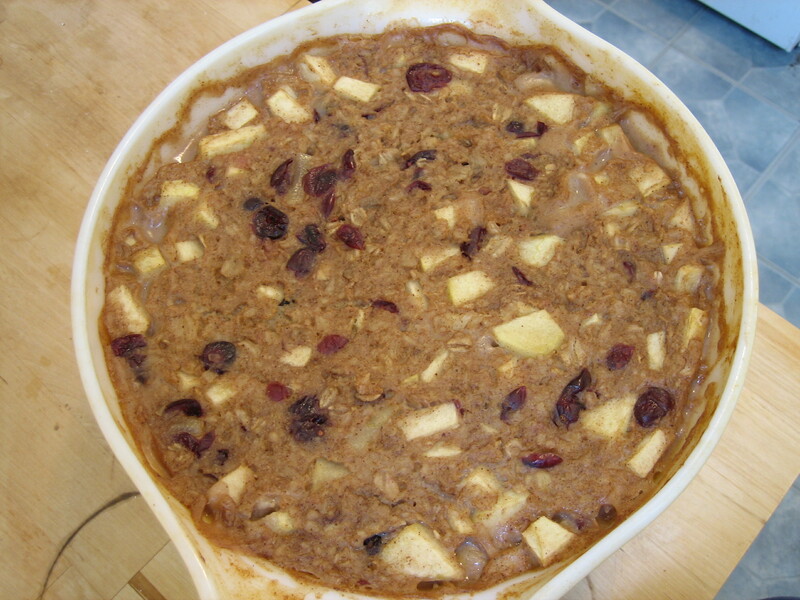 This entry was posted on May 11, 2008 at 7:40 pm and is filed under baking, Food, recipe. You can subscribe via RSS 2.0 feed to this post's comments. You can comment below, or link to this permanent URL from your own site. Slander not l’avoine! Oatmeal is divine. I wonder what this would look / taste like with steel cut? I find it holds up better in baking projects (but needs a pre-soak).